The Piper Vagabond (PA15 & PA17) is the first aircraft in the Short Wing Piper lineage. The Vagabond is a great airplane, it is simple and easy; ownership is affordable on a middle class income and is inexpensive to operate. The Vagabond is an honest airplane but its short coupled gear will quickly tell on the lazy footed pilot-it is basic but requires good basic technique, something that most airplanes don’t. The baggage compartment is surprising large and cockpit is relatively comfortable when compared with similar planes of the era. The 30’ wingspan gives the Vagabond a “snappy” roll rate and helps to reduce drag yielding cruise speeds around 90 mph, depending on loading, at less than 4 ½ gph fuel burn. 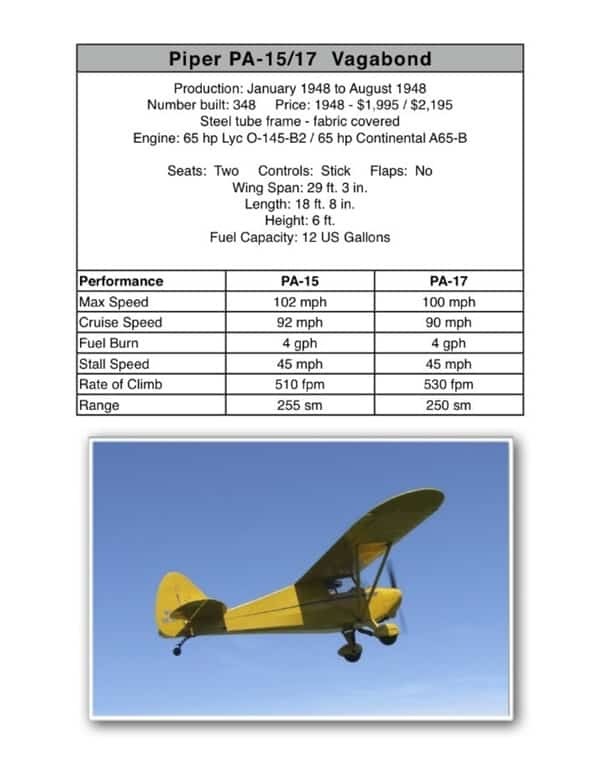 There are two Vagabond models; the PA-15 and PA-17, and each has separate FAA Type Certificates. 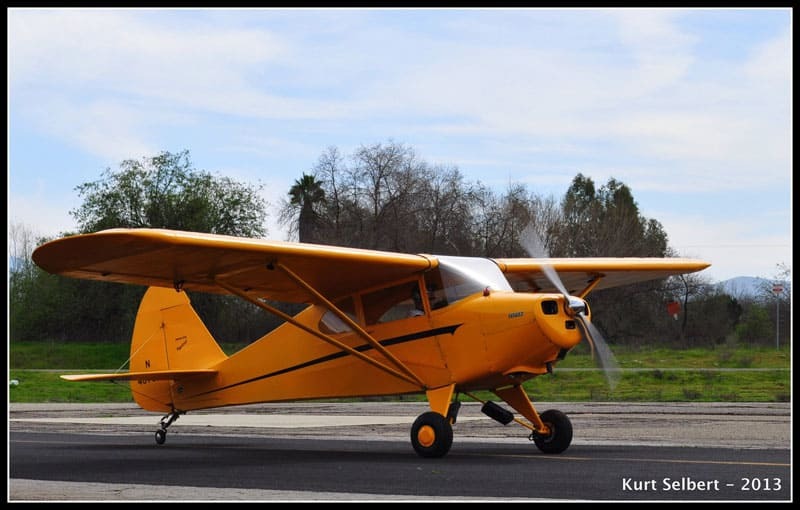 Both planes are conventional gear (tail wheel), fabric covered and equipped with a bench seat for two people. It features a single door; it was originally powered with a 65 hp engine with a 12 gallon fuel tank, no flaps and no electrical system. The Vagabond was born out of Piper’s bankruptcy. Hard-nosed creditors, attempting to recoup money, forced Piper Aircraft to design and build a two seat aircraft. To be competitive in the changing market, the creditors required the yet to be designed plane to offer side by side seating (not tandem) and be built as economically as possible. Under high pressure in late 1946 two of Piper’s sons, Tony and Howard, and Chief Design Engineer Dave Howard, designed and created a set of blueprints in six weeks and two days. To save money and maximize profits the new design used parts that were in Piper’s inventory: tires, engine, tubing, fabric, paint, instruments, tail surfaces, ailerons, landing gear etc. The Vagabond was bare bones in design and Piper built approximately 600. The PA-15 had no bungee gear (shock absorption depended on the low pressure of the 6.00×4.00 tires), no fuselage paint stripe, flight controls only on the left side and no baggage compartment. Shortly afterwards the PA-17 Vagabond was offered and was dubbed the Vagabond Trainer. It had bungee gear, a paint stripe, dual flight controls (rudder pedals on both sides with brakes only on the left hand side) and a roomy baggage compartment. Both airplanes had a 65 horsepower engine and a 12 gallon fuel tank. A great resource for Piper History is the book Mr. Piper and his Cubs by Devon Earl Francis. This PA-15/17 Vagabond description was written by former Vagabond owner, Christopher Thomas – Thank you, Chris!